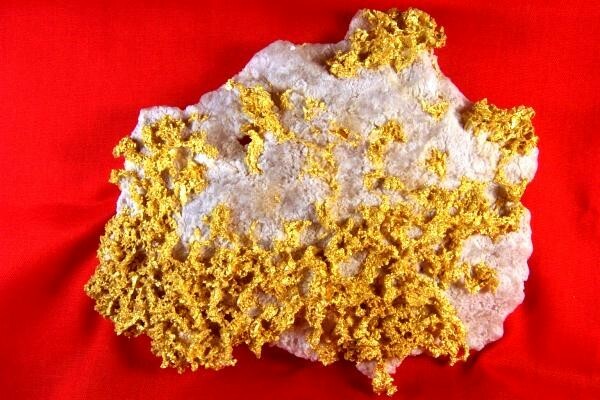 This gorgeous gold in quartz specimen is from a new mine find in Tuolumne County, California. For security reasons the guys who found the new mine won't disclose it's name or location until they have completed mining the vein. The vein is extremely rich as you can see in the photos of this spectacular gold specimen. One of the beautiful things about this find is that the gold is coming out in layers of gorgeous crystalline gold in quartz approximately 1/2" (12 mm) thick, which means the surface area of these gold specimens is massive. This one weighs 12.4 Troy Ounces (385.6 Grams) with a gold content (verified by a specific gravity test) of 8.28 Troy Ounces (257.51 Grams) and the size is a massive 5.25" long x 4" wide x 1/2" thick. 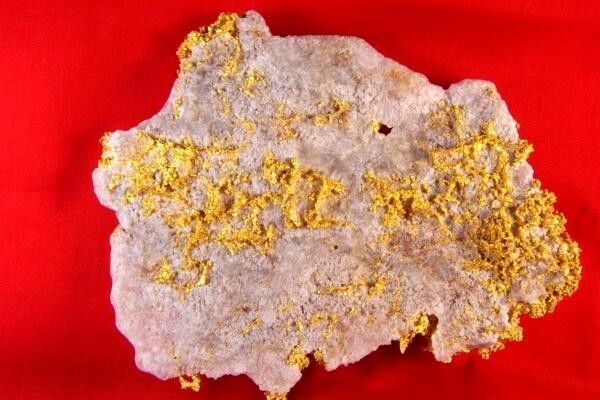 This is one of the largest of the gold specimens that I have from this location.